Paul Crowe - "The Kneeslider"
Have you ever noticed how once you start looking for things, they just seem to jump out all over the place, like W configuration engines. After mentioning the Anzani W3 the other day, I came across another one I had never seen before, this one is the Moto Guzzi arrow W103, a 3 cylinder engine in a V-Triple, arrow or “W” configuration. 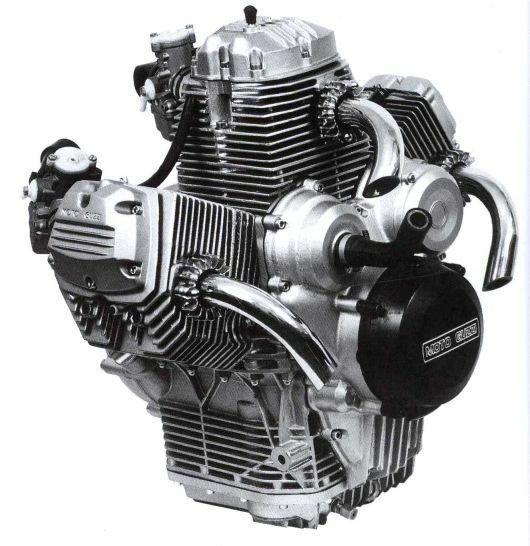 This arrow configuration engine was designed in 1981-1982 by Lino Tonti. It displaces 992cc, with 3 cylinders set at 65 degrees. Valves were push rod operated from 2 cams in the block by the central cylinder. It was equipped with three 30mm Del’Ortos. The factory identifier was W103. What you see in the photo was as far as development went, which is really too bad, it would have been interesting to see this mounted in a running prototype motorcycle of some sort. Note: Some uses the “arrow” designation for the cylinder layout instead of “W” which I wasn’t used to seeing, but it makes sense and is actually more accurate, though the factory used a W prefix for the identifier. Is there a consensus on which is more correct? Since there are so few engines of this particular type, both are probably acceptable. Interesting.